This picture was taken on January 17, 1907- 117 years ago today! 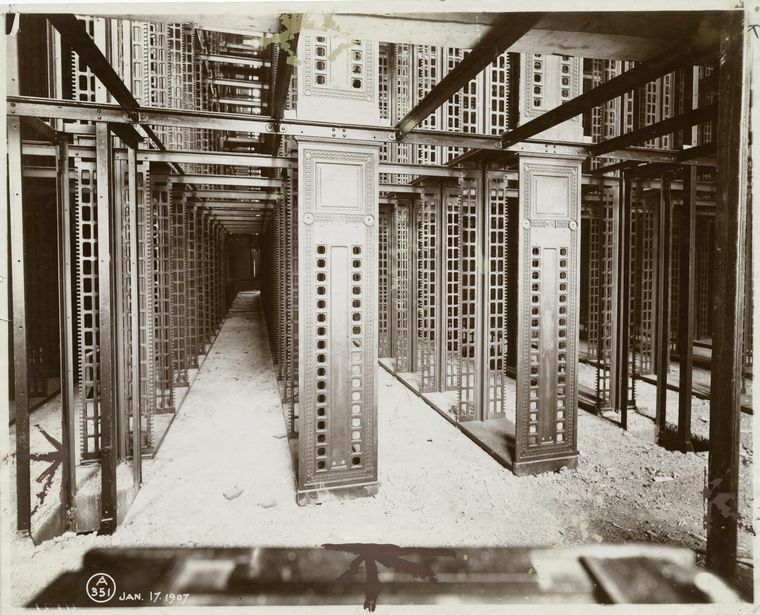 The shot depicts the construction of the stacks in the main branch of the New York Public Library. After almost a decade of construction, the main building had its opening ceremony on May 23, 1911. 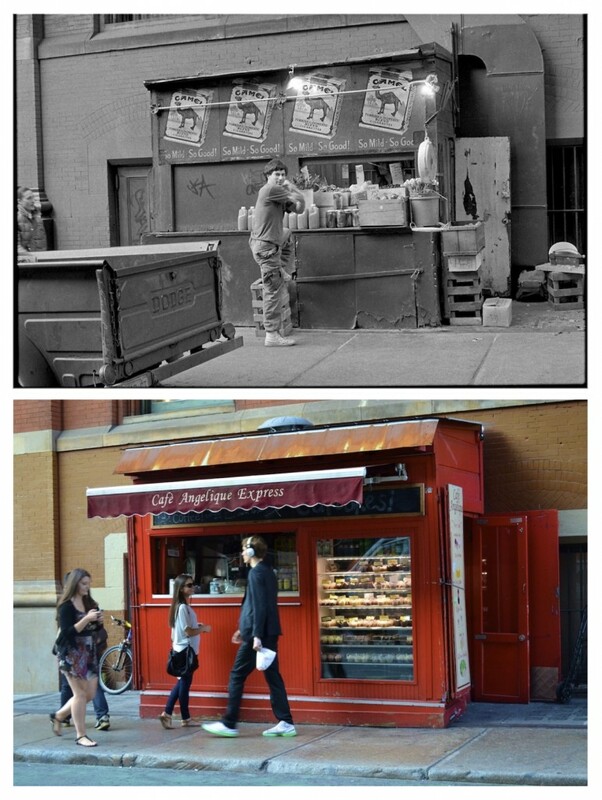 For more history and pictures of the library under construction, read my post “Then and Now: New York Public Library“. I just finished updating my “New Year Nostalgia” photo collection this morning! I love seeing hairstyles, fashion, and home decor evolve over the decades. 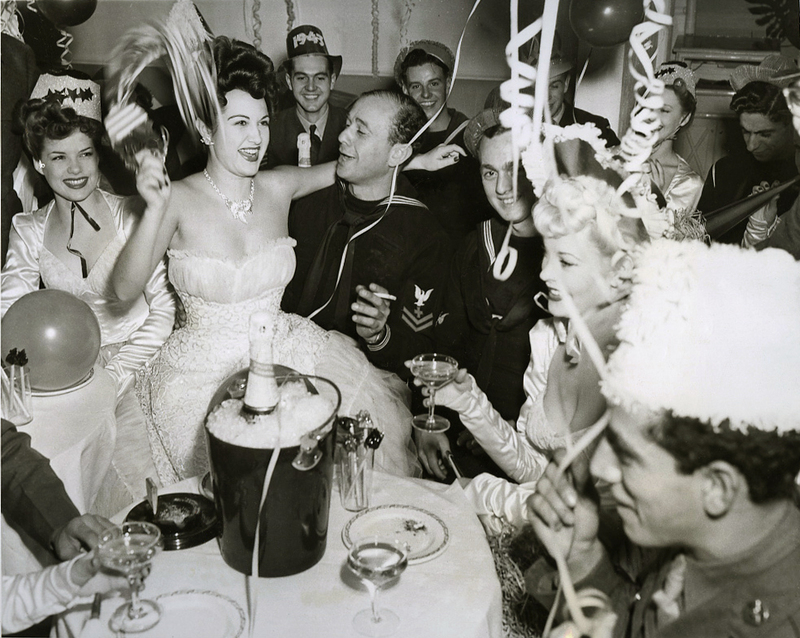 This shot is from New Year’s Eve 1942. Click here to view more nostalgic photographs. Happy New Year! Happy Birthday, Radio City Music Hall! 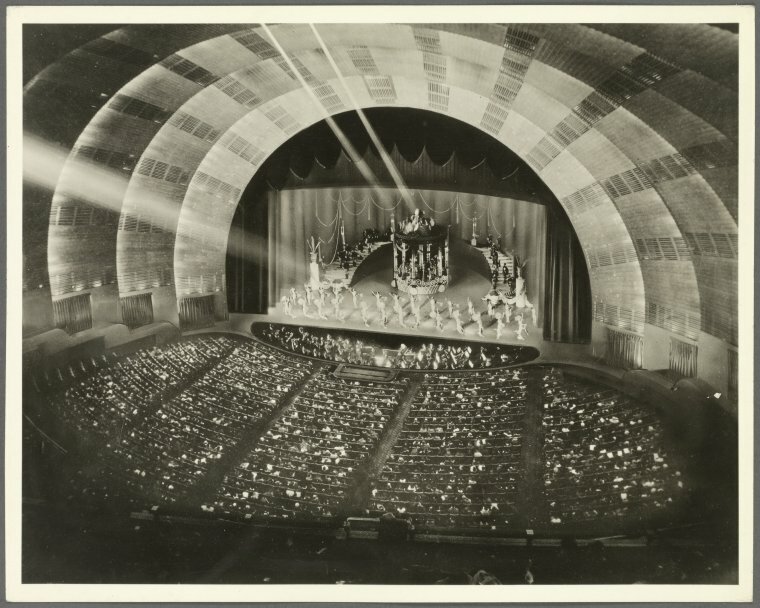 On December 27, 1932, Radio City Music Hall opened its doors to the public! 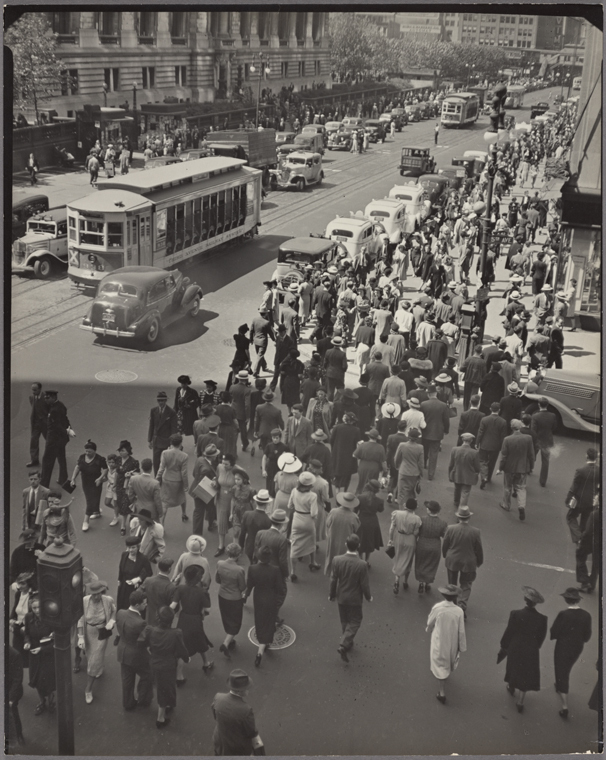 Construction began on the project in 1930 on land leased by John D. Rockefeller, Jr. His original plan was to help gentrify the neighborhood (coined the “speakeasy belt”) by building a new Metropolitan Opera House but the idea was scratched after the stock market crash of 1929 and Rockefeller instead opted to create a complex of buildings (Rockefeller Center) to attract commercial tenants. 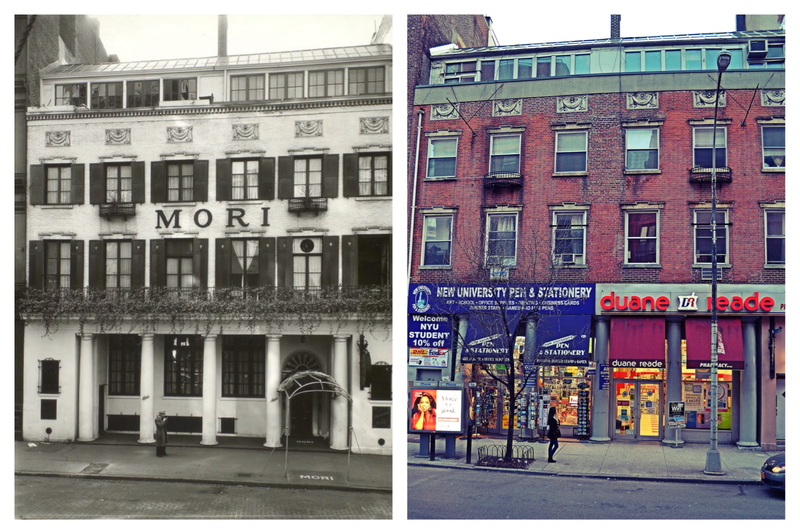 Another plan that was changed was the name of the music hall Rockefeller decided to build in this complex. Originally, the name was going to be the “International Music Hall” but was changed to “Radio City Music Hall” when the Radio Corporation of America became one of the complex’s first tenants. Working on the project along with Rockefeller were Samuel Roxy Rothafel (of the Roxy Theatre/Rockettes) and RCA chairman David Sarnoff. 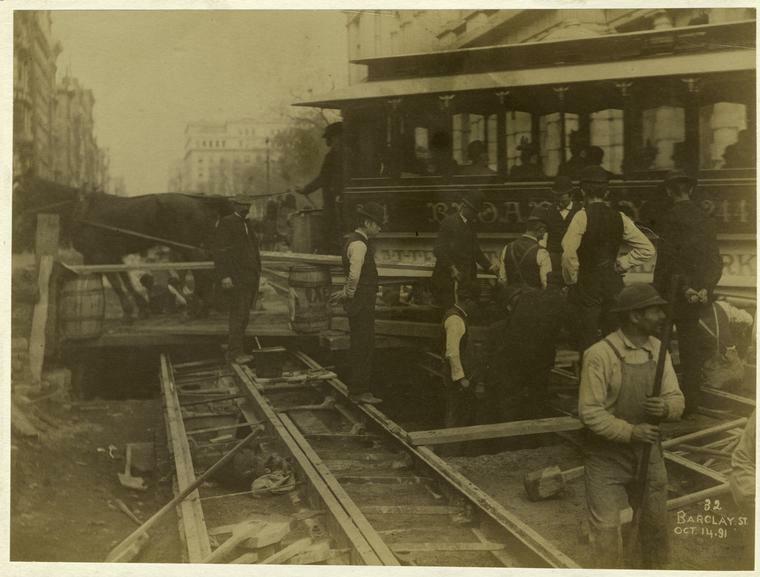 Keep reading to view old photos of the tunnel under construction and its early days! Happy Birthday and Reopening, Statue of Liberty! Happy Birthday, Statue of Liberty! The Statue of Liberty, designed by French sculptor Frédéric Bartholdi, was a gift from France and took 21 years from its conception (1865) to its completion in New York Harbor. 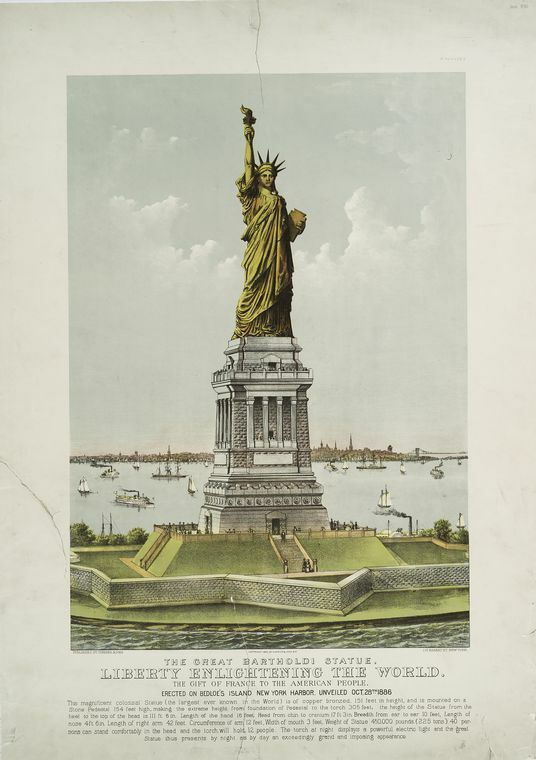 After years of struggling to raise the money for the pedestal (France required the US would provide), the statue finally made its way to America on June 17, 1885 and by April of 1886, the pedestal was complete and construction began placing Lady Liberty on her outlook from Bedloe’s Island. The Statue of Liberty opened on October 28, 1886 with a dedication ceremony led by President Grover Cleveland and a parade that traveled from Madison Square to the southern tip of the Manhattan! Today is also another special day for The Statue of Liberty: today, the statue reopened exactly one year after closing due to the damage caused from Hurricane Sandy! In honor of its 127th birthday and reopening, I put together some old photos and illustrations of The Statue of Liberty under construction and at its unveiling. Click on images to enlarge. Happy Birthday, Rita Hayworth! Rita was born Margarita Carmen Cansino on October 17, 1918 in Brooklyn, New York. She was one of the biggest stars of the 1940s and her story is fascinating. Today, I came across an article called “Scandals of Classic Hollywood: Rita Hayworth, Tragic Princess” and couldn’t believe how interesting her life was. From her transformation from Latina Margarita into red-headed Rita, to her many rocky marriages and hardships…I hadn’t known about the woman behind the pin-up picture and upbeat dance numbers with Fred Astaire. I just ordered her biography so I can learn more! Click here to get lost on YouTube watching Rita videos. 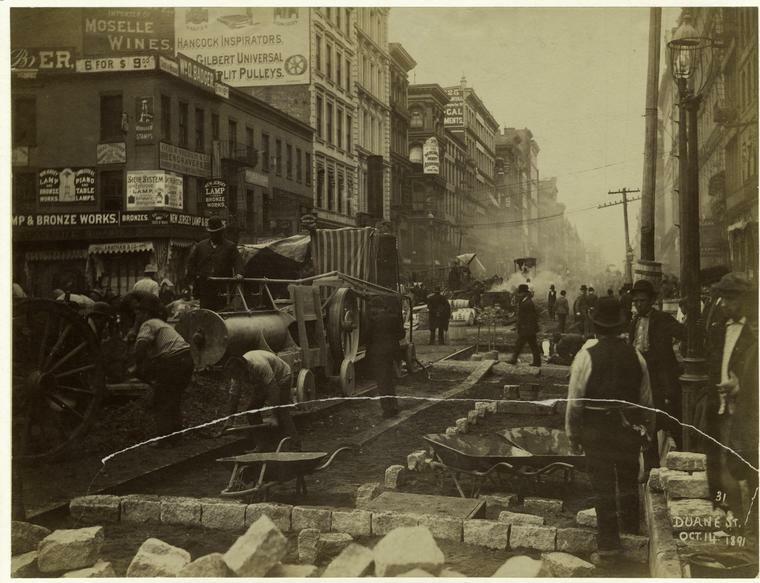 I love these photos of construction on Duane and Barclay Streets taken 122 years ago today! 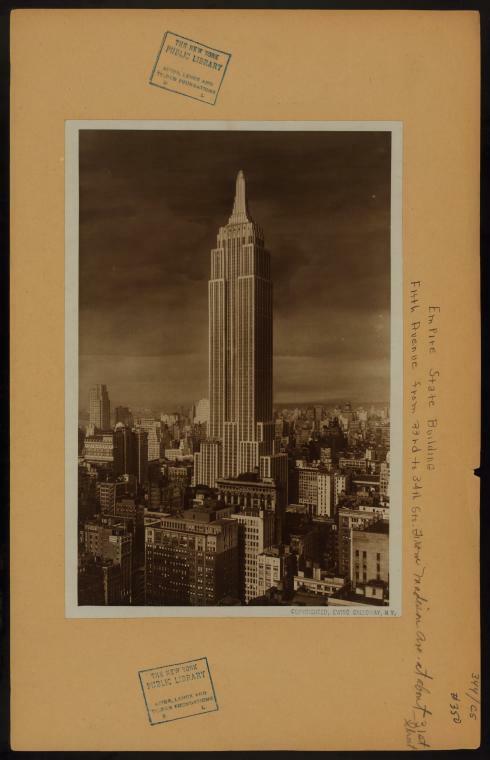 I love this shot of the Empire State Building nearing completion in 1931. The observation deck hadn’t been constructed yet so the photo was retouched to add it in! 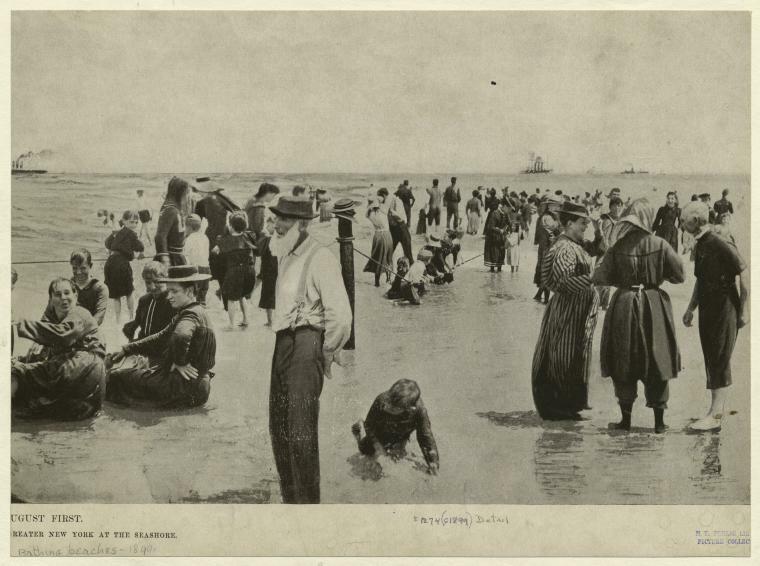 I’m heading to the beach for the week so I decided to do a post dedicated to old, nostalgic photos from New York beaches. Can you imagine wearing these “swimsuits”? Those dresses must have been so hot and heavy! On August 14, 1945, when the surrender of Japan was announced in the United States, ending World War II, everyone took to the the streets to celebrate. 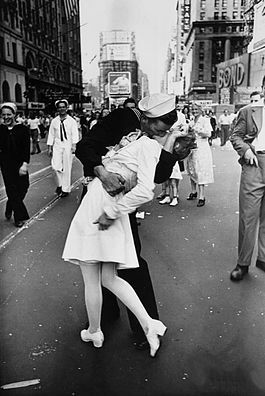 In Times Square, a photographer named Alfred Eisenstaedt was taking pictures of the spontaneous scene and spotted a young sailor running around kissing every woman he could find. 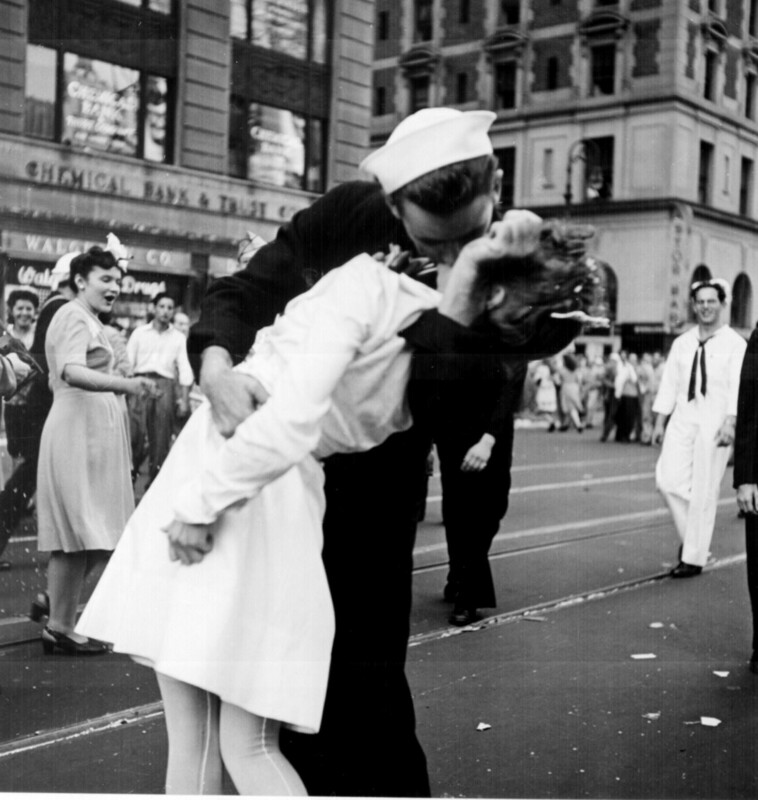 Just south of 45th street, the man grabbed a nurse and Alfred captured the moment of their kiss, with the intersection of Broadway and Seventh in the background. The photo, entitled V-J Day in Times Square, was published a week later in a Life magazine spread and become one of the most iconic images of the era.